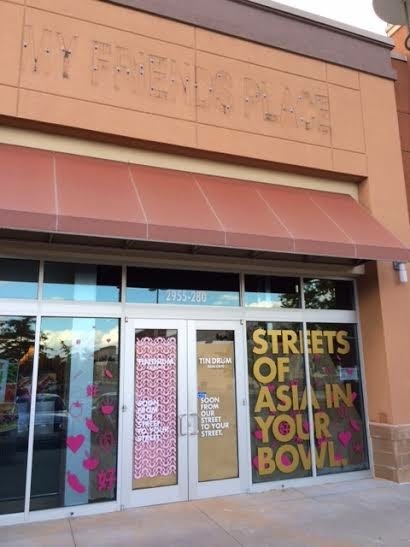 A new Tin Drum Asiacafe is coming soon to Akers Mill shopping center near Cumberland Mall. The new Tin Drum Asiacafe will open in the former My Friends Place restaurant space, next to Uncle Maddio's Pizza Joint. This will be the thirteenth location for the Atlanta-based chain and is likely to sport the chain's new look and layout which debuted in the Village at Druid Hills location that opened earlier this past summer. The Akers Mill Tin Drum will be a franchised location. Akers Mill has welcomed a number of new eateries over the past couple years including a number of new to market options. Both College Station, Texas-based Grub Burger Bar and Boca Raton, Florida-based Brooklyn Water Bagel have opened in Akers Mill with plans in the works to add additional locations in metro Atlanta. Additionally, Pollo Tropical, Zoes Kitchen, Corner Bakery, Uncle Maddio's Pizza Joint and a relocated LongHorn Steakhouse have all opened at Akers Mill in the past couple of years. What is your favorite place to eat near Cumberland Mall? Do you like the changes at Tin Drum? Where would you like to see the next Tin Drum open? Huge fan of Grub Burger at Akers Mill. Cool place, great burgers, good staff, shakes are awesome, too. I work in this area and agree with the first poster, Grub Burger is really, really good. Brooklyn Water Bagel and Corner Bakery have the most lazy, disinterested staff ever and I've stopped going to both because of it. I can tell you the owner of My Friends Place told us he was closing because they doubled his rent from $25/sq. foot to $50, so he decided to close up and retire to Hilton Head. I always thought the place was just ok, but it had a huge following in my office especially for catering. Never eaten at that location of My Friend's Place, although I have walked by it on the way to Subway hundreds of times. It is the most well-run Subway location you'll find. I still need to try Grub Burger, but have heard only good things. I tried Brooklyn Bagels once and never went back. That center has really revitalized itself over the past 5 years by adding a lot of new space and backfilling the empty spaces with new tenants. Any news on when the AMC theater down the street at Parkway Pointe will re-open?